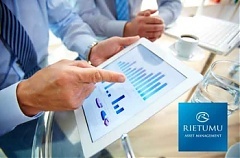 The specialists of Rietumu Group have prepared an overview on the return of the investment funds of Rietumu Asset Management (RAM) for December 2017. Along with information on the structure and dynamics of the funds, the review contains the traditional analysis of the current political events and key economic factors that exert an influence on financial markets, informed BC Rietumu’s press service. Nord Stream 2 AG today received the construction and operation permit for the planned pipeline in German territorial waters and the landfall area in Lubmin, near Greifswald. The Stralsund Mining Authority issued the official approval for this approximately 55-kilometre-long section of the pipeline in accordance with the Energy Industry Act (EnWG). According to the preliminary data of Statistics Estonia, in 2017, the production of industrial enterprises rose 8% compared to the previous year. Production volume increased in energy, mining and manufacturing. Following protests from Estonia and Latvia, the government of Ukraine removed Estonia, Latvia, Georgia, Malta and Hungary from the list of countries viewed by Ukraine as tax havens, informs LETA/BNS/Interfax. The Latvian banking sector closed 2017 with EUR 236.101 million in aggregate profit, down 48% from 2016, writes LETA, according to the data released by the Finance and Capital Market Commission (FCMC). Lithuania's oil product and liquefied natural gas (LNG) terminals operator Klaipedos Nafta (Klaipeda Oil) posted 17.031 million euros in net profit in 2017, up by 23.5%, from 13.794 million euros in 2016, informs LETA/BNS. The Lithuanian National Security Commission, headed by the prime minister, on January 31st decided to set up a closed communication network for the key state institutions, informs LETA/BNS.